Abundant sunshine, low humidity and year round high temperatures are the main characteristics of the weather in Palm Springs. Winter days are among the mildest in the US, and the high temperature is rarely less than 65°F though a few nights each year do fall below zero. The days warm up steadily during spring, usually passing 100°F (38°C) for the first time in May, though all months apart from Dec, Jan and Feb have recorded 100 degree days, something unmatched by any other US destination. 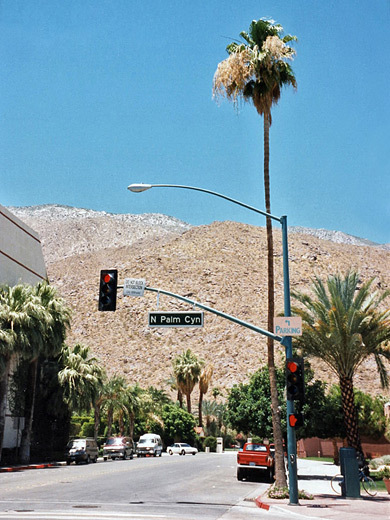 In summertime, the highs are not quite so extreme as other locations in the Sonoran Desert further east; the proximity to the Pacific Ocean restricts normal highs to around 110°F, unlike the 120°F+ for places along the Colorado River and around Death Valley, but Palm Springs is one of the top five consistently hot cities in the US. Relief from the heat is not too far away though - either by heading west towards the coast or driving up into the San Jacinto Mountains, where the temperature at the top may be as much as 40° cooler. On average 354 days in Palm Springs each year are sunny, and the percentage of available sunshine is about 85; not quite a record, as places a little further east such as Yuma in Arizona have even less clouds, and up to 90% sun. The air quality is always good since the mountains provide a barrier to the smog above the Los Angeles basin, and humidity is low, reflecting the small annual rainfall total of only 5.8 inches, and around 20 days each year on which rain actually falls. Wind is often quite strong, especially to the west of town at the San Gorgonio Pass, where the prevailing air flow is channeled through a quite narrow valley between two 9,000 foot mountain ranges.